Amazon has just launched its long-awaited Spotify competitor, Amazon Music Unlimited. Like Spotify, Apple Music, Tidal, Google Play, and Deezer, Amazon Music Unlimited offers on-demand access to tens of millions of songs. And like those services, it also offers “thousands” of “hand curated playlists” and personalized stations. So why would anyone want Amazon Music Unlimited? If you’re an Amazon Prime member, it might come down to price. Amazon Music Unlimited will cost $9.99 a month—standard fare for streaming services—but Prime members can get it for $7.99 a month or $79.99 a year. If you do the yearly option, that comes out to $6.58 a month. Amazon also says it will be doing a family plan—similar to what Spotify, Google, and Apple offer—for up to six people for $14.99 a month or $150 a year. Again, this is the same price that the other services sell family plans for, but the yearly pricing does save you some coin. Aside from price, the differentiator for Amazon Music Unlimited is its integration with the Amazon Echo. The Amazon Music integration does some cool stuff. Play songs based on lyrics. Say, “Alexa, play the song that goes [insert lyrics]” to play that tune stuck in your head. 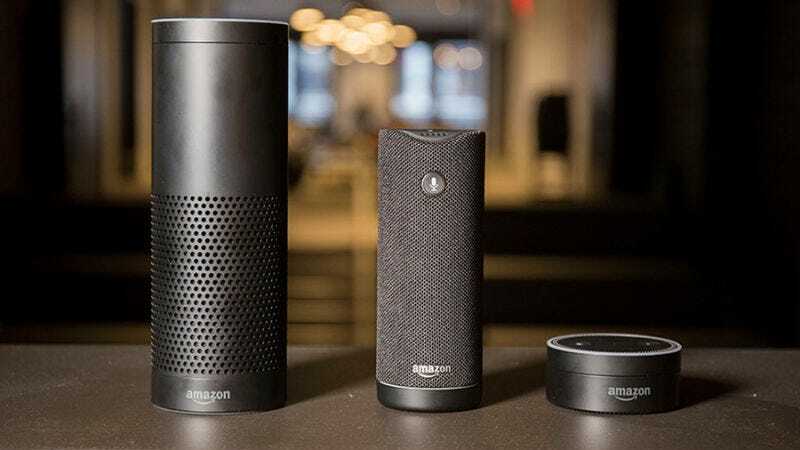 You can use the Amazon Echo to control other music services, but you’ll get the most granular voice control with Amazon Music. Amazon is also offering a special Echo-only rate plan for Amazon Music Unlimited. For $3.99 a month, you can listen to Amazon Music Unlimited on a single Amazon Echo device. Look, $4 a month for streaming music is a great deal, but for us, being limited to a single device, makes it seem pretty silly. After all, I can’t imagine many people who only listen to music on their Echo, Echo Dot, or Echo Tap. And if you were the type of person who listened to music only on an Echo, you’d probably want more than one for your house, in which case this plan isn’t any good. Like the existing Amazon Music apps, Music Unlimited has apps for iOS, Android, Mac, PC, Fire devices, Sonos, and more. Amazon certainly isn’t reinventing the wheel with Music Unlimited—it’s actually just glomming onto an already crowded market. Still, the price might be good enough to get some Amazon fanatics who aren’t already committed to Spotify or Apple to consider jumping.